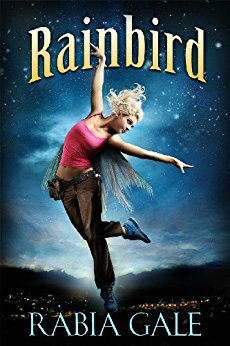 Rainbird is an exotic scifi-fantasy-steampunk story that throws you right into the middle of a strange and original world. Rainbird works with her father as an inspector on the sunway, the path that the daysun travels each day as it moves between the factories that it powers and the top of the celestial dragon’s skeleton. Rainbird is a half-breed, a half-human/half-eiree hybrid abandoned by her mother and captured and abused by a man she ends up murdering to escape his circus. Here on the sunway, she and her father make a living maintaining the sunway, while disguising Rainbird’s identity as a half-breed fugitive. What happens when they find bonerot and a conspiracy to keep it from being treated? Rainbird must fight to keep her father alive, withstand prejudice from both her parents’ races, rescue a company scientist, and find unexpected allies. And she makes a startling discovery about the dead celestial dragon upon which all her world depends. This is a quick, fun, mind-bending read. The world-building is scattered through the story, although it didn’t always feel like enough background, yet I was left believing in the world anyway. I felt the story was reflected really well in the totally amazing cover art. It felt as if this story was a teaser, in a way; it was so enthralling and original, and there was so much room for growth with so many characters. If I had any complaint, it would be that I’d love for this to be a longer story and have a sequel. But as it stands seemingly complete, I must be happy with finding such an original adventure and read the author’s other books. Highly recommended. Rainbird never belonged. To the humans, she’s a runaway criminal. To the winged eiree, she’s an abomination that should never have existed. She lives on the sunway, a massive track made from the skeleton of a continent-sized dragon. Up here, Rainbird is safe, as long as she keeps her head down, does her job, and never ever draws attention to herself.